Welcome to our newly finished basement apartment! We are located in beautiful Heber City, UT only 20-25 minutes from Park City! 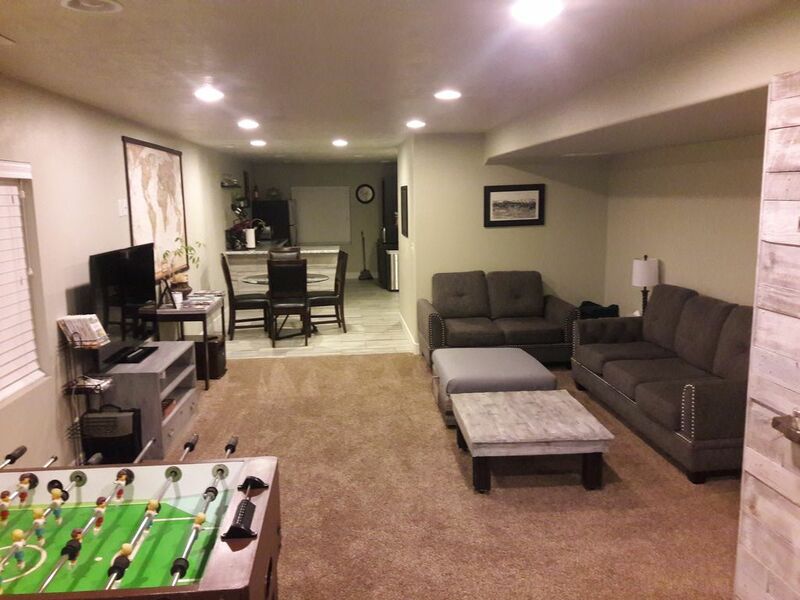 Come enjoy 1400 sq ft of comfortable living space with your own separate basement entry. With 2 bedrooms, 1 full bathroom, kitchen, dining area and living room, you have all you need to make your stay comfortable and enjoyable. The exterior parking space and side alley are graveled. The kitchen doesn't have a range, but a cooktop and toaster oven are available. Please respect our property. We have put a lot of work and money into this apartment and want to keep it nice for other guests. Absolutely no illegal drug use in or near the apartment. No smoking or pets in the apartment. Legal smoking is allowed outside in the alley way near the entry, but please be responsible and courteous. No loud music and please keep the TV to a reasonable level. No foosball, music, loud tv volume, or loud talking or shouting after 10 pm. No parties or visitors after 10 pm. We live upstairs and will be sleeping during this time. Please load and run dishwasher and do basic straightening up before you leave. Trash should be taken out to the large black trash can near the garage door as needed and at the end of your stay. If you do break or damage something, please let us know. We will be more conservative on the deposit amount withheld if you are honest with us. Please leave apartment keys on the kitchen counter or in the key lockbox when you leave and lock the door on your way out. Key replacement fee is $20. Our family of 4 lives upstairs. With 2 growing boys, you will hear some movement and activity overhead, but the boys are in bed by 8 pm on weekdays, 9 pm on weekends. New and clean with reasonable rates. We live in a quiet family neighborhood. Please respect our neighbors and watch for children while driving, especially when backing out of the driveway. Set at 70 degrees for entire house. Set at 70 degrees for entire house. There are also 2 portable radiator heaters available. 1 parking spot on gravel next to our driveway. 1 set of towels provided per guest. Bottled and filtered water, salt and pepper. No range, but there is a cooktop and toaster oven for your use. Smart TV that can access Netflix using your phones hotspot. Wii with 2 controllers and games. Beautiful apartment in a great location. Very clean & inviting. Price is right! Very nice apartment! Great location, quiet, safe neighborhood and the price is right. Couldn't ask for a cleaner, more inviting place to stay. Two large, comfortable beds with beautiful kitchen and bath. We loved how clean it was, very inviting! Would definitely stay there again. Highly recommend! The apartment is comfortable and tastefully decorated (Joanna Gaines style). The location is perfect for visiting the Homestead Crater for open water scuba certification. Grocery, restaurants, everything you need is just minutes away. We were pleasantly surprised by the beauty surrounding Heber City and the friendly community. This location was perfect for us and just a few blocks from the venue we were attending. 5 stars! This was very easy to find and was a basement apartment beautifully done. We had a very comfortable stay and had everything there we needed. It was very comfortable and had all the amenities we needed. We would stay again if we were headed that way. This apartment was exactly what we needed. We had a late night event planned and didn't want to make the drive back to SLC. When we found this place it was perfect! Plenty of space for our large family. Our kids loved the foosball table and games. There isn't a regular stove/oven, but the hotplate and griddle worked just fine for cooking breakfast. The home is close to everything in Heber and just a short drive from Park City. The owner went out of his way to let us know about an item we left behind. We'll be back soon without a doubt. Property is nearly new and very well maintained. We loved the quiet location and private entrance. Property is exactly like the pictures. Beds are comfortable and owner was very accommodating. We would definitely stay here again! My family enjoyed the apartment. We especially liked the foosball table and board games! There was plenty of blankets and amenities to make our stay even more comfortable. We would definitely stay here again!